The 2013 Philadelphia Phillies still have some of the stars from the 2008 World Series championship team, but right now they look like a different ballclub entirely. The veteran group has a record of 38-41 so far this season and is trailing the Atlanta Braves by seven games in the National League East as of June 26. “If you’ve watched us all year long, you’ve seen the inconsistent part of it, and that’s kind of how we play,” Phillies manager Charlie Manuel told Stephen Pianovich of MLB.com. Although the Phillies have been inconsistent, there are a few players who have still been shining. 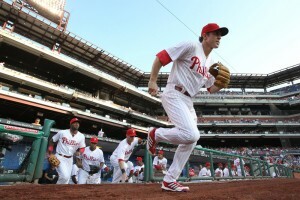 Veteran first baseman Ryan Howard, starting pitcher Cliff Lee and third basemen Michael Young have tried to lead the Phightin’ Phils in the right direction. Howard has 41 RBI, and his current batting average is .272, which would be his highest mark since 2010. Lee has a record of 9-2 and an ERA of 2.51. Young has a team-leading batting average of .281. The Phillies also have a surprising All-Star candidate in Domonic Brown. Brown is second in the National League with 20 home runs. The 26-year-old also boasts a .276 average with 54 RBI. But some players can’t seem to get it together. Starting pitcher Cole Hamels has a record of 2-11 with an ERA of 4.58. The 11 losses for Hamels already ties him for a career high, and not the good kind. Also, two-time Cy Young winner Roy Halladay had to stop his season early to have shoulder surgery. It is unclear when or if Halladay will come back this season. Closer Jonathan Papelbon has been far from perfect this season. He has blown four saves so far, all since June 17, which already ties his number from 2012. Former National League MVP Jimmy Rollins is having a down year for a batter who consistently bats first, second or third in the lineup. The shortstop is batting only .257 with 25 RBI and will need to contribute much more if the Phillies want to stay competitive. Catcher Carlos Ruiz is finally coming back to form after serving his 25-game suspension and enduring injuries for much of the first half of the season. Ruiz is hitting .346 in seven games since coming back from the disabled list June 18. The struggling Phillies have only held a winning record once so far this season. The good news for the Phillies is that it is only the halfway point. The Phillies will need to start making the necessary adjustments if they want a shot at a playoff bid. If Philadelphia still has a losing record come the All-Star break, you can almost guarantee that Phillies General Manager Ruben Amaro, Jr. will draw up some possible trades. The Phillies have dug themselves into a hole this season, but they still have a chance to crawl out. If they can hang around the division lead come August, they may be able to make a late-season push. Since last season, the Major League Baseball playoffs have included an additional wild-card spot, which increases Philadelphia’s chances of making the postseason. The Phillies are underdogs to make the 2013 playoffs, but if any ballclub can pull off an October surprise, it’s the Phightin’ Phils.